I'm so happy it's Friday as it means the weekend is almost here - yipee. 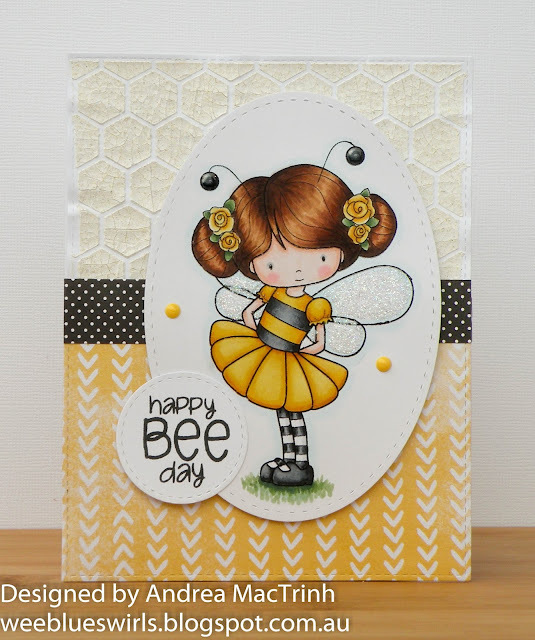 Today I'm sharing a card I created for my Whimsie Doodles post. This super sweet image is called Bee-atrice. Her outfit is so cute and fun to colour. I coloured her with my copics and added some glamour dust to the wings and glossy accents to her antennae. I die-cut a large rectangle using a die from Blueprints 15 and then created a honeycomb background with MFT mini chicken wire stencil and some crackled texture paste. Before applying the paste I stirred in a little yellow and gold glitter. It has produced a very subtle effect which twinkles in the light :) I adhered a piece of yellow Amy Tangerine paper to the bottom half of the card and also added to border of black dotted paper. The semtiment is from SSS circle friends stamp set. Thanks so much for visiting, hope to see you again soon. Have a great Friday. Cute card! Love the sweet image! Thanks for joining us at Crafty Gals Corner! What a beautiful little image! Love the way you have colored her. Thanks for joining us at Seize the Birthday! A+mazing coloring Andrea! This is a beautiful card! 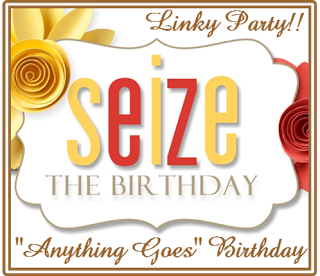 Thanks for joining Seize the birthday!